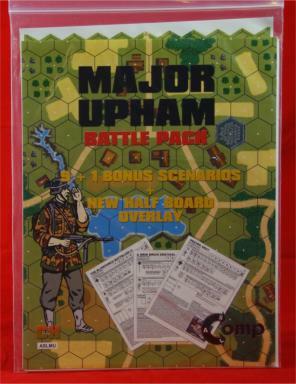 The Major Upham Battle Pack (MUB) is a scenario pack designed by Scott Holst, though he is not credited by name. Somehow, the “Major Upham” in the product’s title is supposed to be a sort of pseudonym for Holst, but the odd name of the pack has led to some criticism for being misleading. In fact, there is indeed something misleading about the pack, but it is not the name of the pack, which doesn’t really matter and which is more or less explained on the Critical Hit Web site. What is NOT explained on the cover of the pack or on the Web site is that a purchaser of this pack needs to own a NUMBER of other products in order to play the scenarios in the pack. The absence of such an explanation is rather inexcusable and will result in a number of people purchasing the pack only to find out that they can play, at best, a fraction of the scenarios they just bought. Essentially, MUB has 9 scenarios (there is ostensibly a 10th, but it is not being counted; see below). Of these 9 scenarios, 1 scenario can be played with the “original” 52 ASL boards from the core modules (it uses Boards 2, 3, and 4 or 2, 4, and 19). Fair enough. 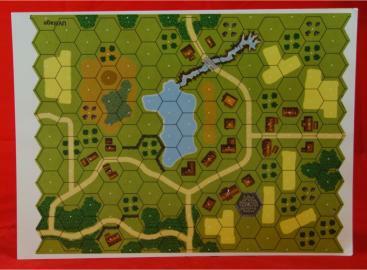 Three more scenarios require one or more of the later mapboards that appeared in products released after 2007 (Specifically, Boards 1b and 3a from Action Pack #6: A Decade of War, 1936-1945, Board 61 from Action Pack #7, Board 63 from Winter Offensive Bonus Pack #2, Boards 64 and 65 from Winter Offensive Bonus Pack #3, and Board 4b from Action Pack #8 (one of these scenarios also uses Board 11). Not as many people may have Bonus Pack maps, but they are all official maps and widely used. However, in addition to these 4 scenarios, there is a 5th scenario, MUB3 (A Grim Brick Sentinal [sic]), which uses the HASL map from Red Barricades, and a 6th scenario, MUB4 (Of Volunteers, Boy Scouts, and Police), which requires the HASL map from Valor of the Guards. Okay, even up to this point all the products required are still “official” ASL products. However, the remaining 3 scenarios all require boards from various Critical Hit products. 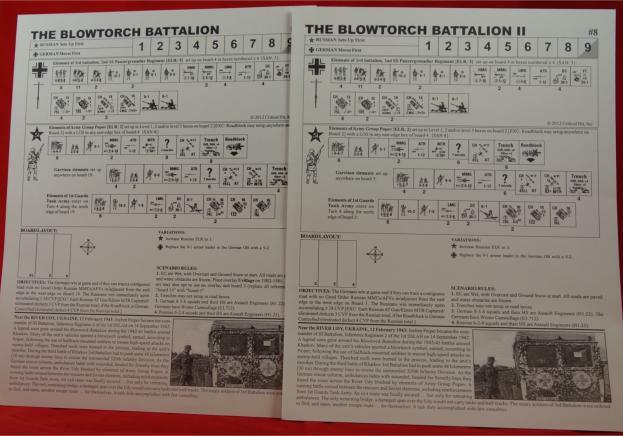 MUB2 (Battle’s Red Glare) requires Board CH1, which appeared only in Gembloux II: The Battle of France 1940, as well as CH2 from A Few Rare Men and SCW2 from Condor Legions. That’s three additional Critical Hit products required to play this one scenario (it should also be noted that all three of those boards suffer from printing errors). MUB5 (Heaven Sent) requires Boards W2, W3, and W4, which appear in Fire and Ice. And MUB10 (Big Trouble in Little Stalingrad) requires historical maps Ponyri 1 and Ponyri 2 from Kursk: Devil’s Domain. In short, to play the 9 scenarios in this pack, the purchaser also needs to own, in addition to the core modules, three Action Packs, 2 Bonus Packs, two official HASL modules, and five different Critical Hit products. That’s something the consumer needs to know right up front! Basically, the large number of different boards required will tend to limit the purchase of this item to those ASLers who usually purchase every new ASL item. *MUB’s packaging refers to 10 scenarios (“9 +1 Bonus Scenario”), but Desperation Morale considers this pack to contain only 9 scenarios. The reason for this is that the “bonus” scenario is nothing but an exact duplicate of one of the original 9 scenarios with one board substituted for another and the included overlay placed on that board. In other words, the sole reason for the second version of this scenario to exist is to justify the inclusion of the overlay, which itself is presumably included solely in order to make the scenario pack seem more purchasable than a pack with just scenario cards. There are really only 9 scenarios in MUB. What are the 9 scenarios like? They depict ETO actions that include Soviets vs. Germans (Soviet Union 1942, 1943 ), Americans vs. Germans (France 1944, Belgium 1944 ), Poles vs. Soviets (Poland 1939 ), and French vs. Germans (Belgium 1940). The scenarios are overwhelmingly large in size; only 2 of the 9 scenarios are in the small-to-medium range. No scenarios use the Night rules, but one scenario uses Air Support and 5 scenarios use OBA. As mentioned above, one of the distinguishing features of this pack is that many of its scenarios require official HASL maps, Critical Hit HASL maps, or Critical Hit geomorphic boards. Though this is not necessarily a good thing for people who do not own all or most of these products, it is a good thing for those who do, as it provides added value to those products–this is especially true for the Critical Hit geomorphic mapboards, which are otherwise doomed to see little play. The scenario that uses the Red Barricades map is set in Stalingrad and the scenario that uses the Kursk/Ponyri maps is set at Kursk. However, MUB4 (Of Volunteers, Boy Scouts, and Police) is different, because it uses a portion of the Valor of the Guards HASL map to represent not Stalingrad but the city of Grodno in Poland. While one might think that scenario designers would frequently choose to utilize HASL maps as generic or representative terrain in this fashion, instead of solely using them for their original representational purpose, in fact, this does not seem to happen very often. Moreover, when it does happen, those scenarios do not seem to get played very much. It is hard to understand why this is the case; perhaps players are simply less able to suspend their disbelief when asked to treat a HASL map as some other geographical location? One hopes that MUB4 does not suffer this fate, as this is a rather unique opportunity for Poles to see city fighting on an HASL map. MUB2 (Battle’s Red Glare) is a very straightforward U.S.-German tournament-sized scenario. MUB5 (Heaven Sent) uses the winterized W2-4 boards to depict the snowy Ardennes forest in a large combined arms American attack. MUB9 (Elan of the 11th Dragoons) depicts a May 1940 German armored attack against a French force that is partially choosable by the French player. Assuming the scenarios are well-developed and playtested–which is definitely not a given with this designer/publisher combination–the pack looks rather interesting, at least for players interested in meaty actions. It is a shame that the lack of consumer information on the packaging and the CH Web site will result in a number of people purchasing it who will have no real chance to play many of the scenarios.